There are many cleaning products available on the market for every imaginable situation, but it is difficult to determine the impact these products may have on our health. Of course, there are instances in which you should use a specialised cleaning solution. However for general cleaning, you can use natural products from your home in place of these harsh products. Baking powder is the perfect choice for cleaning your carpet or rugs. It not only neutralises odours but can be mixed with water to form a cleaning paste, perfect for drawing any beverage spills from your carpet! You can also apply baking powder directly to your carpet or rug in powder form, leaving it for a short time to absorb any odours before vacuuming away! White vinegar diluted with water is also an ideal cleaning solution, particularly for your windows, mirrors or glass doors as it leaves a clear, streak free and sparkling finish to the surface of the glass. Don’t like the smell? No problem! You can always add a little lemon juice to the mix to leave a fresh scent and the vinegar smell will disappear once dry anyway! Interestingly you can also use the remaining flesh of your lemon to help dislodge any residue material in your cheese grater or sieve before washing it up too! Items which are not ‘dirty’, but still need to be regularly maintained can be cleaned with water! If you have a steam cleaner, this can be used with various nozzles to clean the whole home. 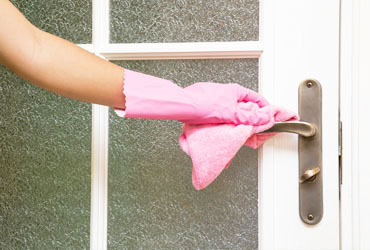 Similarly, items like door handles can be cleaned by simply using a damp cloth, before buffing the handles with a soft, dry towel to remove any moisture. For more tips on becoming more environmentally friendly, why not check out our earlier blogs on How to Save Water in Your Bathroom and Saving Money on Your Energy Bills.